I’ve got much heart-bursting excitement to share with you! I’ve been putting together a (free) virtual summit for the end of this year which I offer as a Big, Beautiful gift for you: an inspiring collection of interviews + practical tools to cultivate your capacity to act in alignment who you want to be in your biz and life. Sign up for the New Way of Working Summit here. I hope you know that the natural professional is so much more than a biz for me. It’s my vehicle to bring more love, awareness and joy into the world by supporting your Becoming of who you’re here to be. Several years ago, aligned with that mission, I named my newsletter the New Way of Working. Even though I was still exploring what that meant, I knew it was real. Majorly significant. Paradigm shifting. But how?!? So I kept exploring and the Natural Professional was as big as my solo-capacity could handle. Sometimes we talked practical organization. Sometimes we talked scheduling strategy. Sometimes we talked about how you want to feel in your biz. And these are all important threads in the New Way of Working. Now we’re talking about bringing them all together in a deep integration of your doing with your being. About cultivating inner guidance that empowers you to make decisions with clarity and ease, leverage your own energy / creativity cycles, and bring forth what you truly want. And I know you’re ready for it. You already have elements of this figured out, and there’s something in you that drew you to the natural professional community in the first place! The difficult part is that working with calm, confidence and clarity is challenged by the old paradigm of stress, fear, and lack every day. Surmountable? Of course. You’ve seen women out there in the world doing amazing, impactful work with ease and grace and marveled, How does she do it? I’m leveling up the Natural Professional (simultaneous joy + freak out — LOL). This last month and a half has surfaced more fears and self-limiting beliefs than you could possibly believe, mamma mia! Along with those, however, have been the beauty and grace of blessings that arise from dedication to my passion-project. A warrior stance of such strength and conviction that moving through discomforts that would have in the past held me back, became fleeting feelings to acknowledge as signposts that This Is Right. 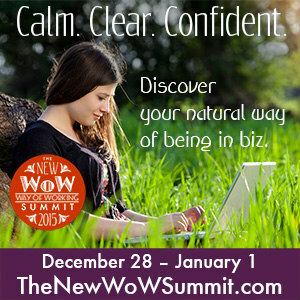 To support you and to grow your toolbox for staying in your place of true power: the New WoW Summit. I identified 10 successful creative women entrepreneurs who are living, breathing and working in the New WoW. I interviewed them. I put together a handbook of their tools + my own methodology. And am making all this available in a free, virtual summit. And thanks to a core Team of beautiful souls, it looks awesome!